What type of posts your readers likes to read? These days bloggers are not focusing on quality or interest of readers. Things that I am seeing today, every blogger is trying to write longer posts. 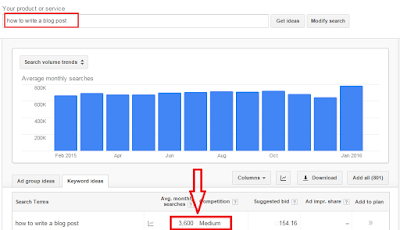 There is a myth that longer posts can be ranked easily and compete others in SERP's. They think that only longer posts rank in major search engines. From here the actual problem begins, they start ignoring the interest of readers. Bloggers to write and make blog post lengthier they start collecting ideas and copying contents from different sites and do include in their own blog posts. This process is also known as Article Spinning. If you also do Article Spinning then stop it now, Google has already started penalizing this type of blogs. Yes, it is a reality that users don't take any interest in your long articles. Even sometimes user simply close the page by seeing a long explanation for a simple and short term. For example, Writing a 5000 Words post on "Definition of Affiliate Marketing"
The simple answer to this query is, "Affiliate marketing is the process of earning a commission by promoting other people's (or company's) products. You find a product you like, promote it to others, and earn a piece of the profit for each sale that you make." Isn't it enough for the meaning of 'Affiliate marketing' term? They why to make it so longer... up to 5000 words? Some bloggers start collecting more (6-7) definitions for the same from different sources to make the article longer. They think that user will stay more time on their website for reading the larger content. But they are absolutely wrong, instead of staying for a long time on the site, they do leave and close the webpage by thinking as just waste of time. It becomes the reason of Pogo Sticking and high bounce rates. Nobody has enough time to read boring stories. But to make the post longer you can use examples, success stories, infographics and make it interesting instead of rotating the same term in all possible ways. I am not criticizing the longer writings but I want you to learn the ways and ideas to make the post interesting too with the length. Do you agree with above-given statements? If Yes, then continue to reading. If not, then simply you should navigate to some other posts of Tips2secure. Because now I am about to write a case study of How I write blog posts for tips2secure that generate high-quality backlinks and thousands of social shares for me. I would like to write some common tips while composing a post. 1. Think as a Reader not like a writer. 2. Why should readers read your post? 4. Use LSI keywords in the Title. 5. Try to solve queries and fulfill needs of your audiences. 6. Write for Readers and Search engines both. (You can learn this technique in the Case study of this post, keep reading). 7. Analyze your competitors for the same topics. Collect data and write a fresh title. 9. Write point to point. Here is the list of 9 best keyword density checker tools that you should use to avoid keyword stuffing in your writing. 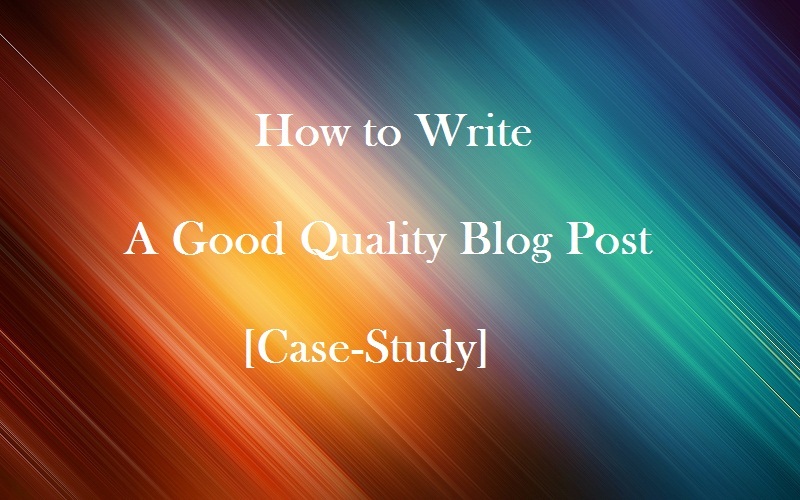 Now, I would like to share my exact steps that I have used writing this post [How to Write a Quality Blog Post]. #1. I chose the topic, "How to Write a Blog Post". I was asked by my readers to write an article on how to write a blog post with step by step including ideas. #2. The next step I did - Collection of ideas and content to write. I finalized writing the Case Study of How I write posts for Tips2secure. #3. The next step I used - Competition Analysis for the topic. I used Google Adwords Keyword planner for this. 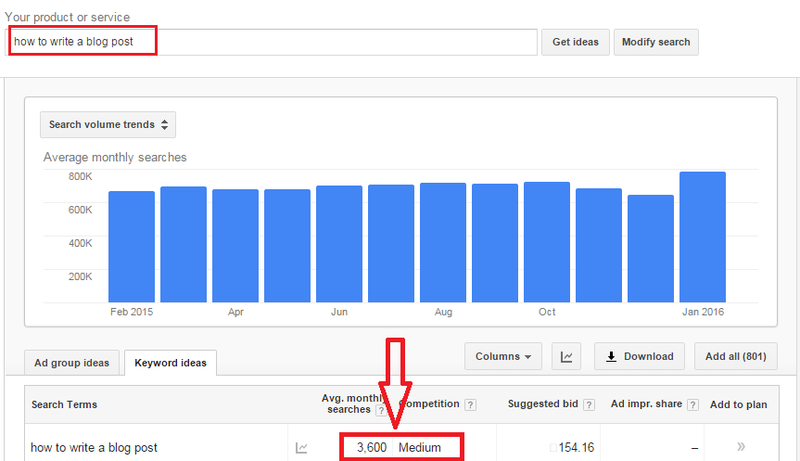 I searched 'how to write a blog post' and found medium competition level with 3600 monthly searches. That was enough good for me. CPC was also good. Here is the screenshot you can check. #4. Now It was the time to finalize a title for the post. I used Buzzsumo to check and analyze the social shares for the same topics. Here is the screenshot. Using Buzzsumo App data I finalized fresh title for this blog post, i.e., "[Case Study] How to Write a Quality Blog Post to get High Quality Backlinks"
How to create fresh headlines for the post from Buzzsumo App. Old Title: "How to build a content strategy using a social media audit"
"The Top 15 Social Media Marketing Strategy Mistakes to Avoid"
#5. It was time to start writing. I always use some quotations, questions, and examples at the start to make readers excited and creating interest in them to read the post fully. So you can also use the same strategy for writing. Disclaimer: If you are reading this line then that all have happened just because of the starting of the post. If my start would be bad then I don't think you would be here. You might have left or closed this page. I hope you have understood what I want to say here. #6. Adding Images & Infographics. I started taking screenshots to include in this post. Screenshots help users to understand the tutorials and guides easily. I never focus a lot on On-Page SEO. I target to use keyword related words in the post. I always avoid using the same keyword again and again in the post. Better to use Synonyms of Keywords. You should always include your keyword in the post title. I give proper credit to the sites from which I use data. In this post, I have given credit to Neil Patel's blog for the fresh title example. Interlinking your blog pages is a major part of onsite SEO. A good internal SEO practice help boosts your rankings by making it easier for Google’s crawlers to access your pages, but it also allows real people to navigate your site and hopefully stick around longer. #10. Final words, Conclusion and Call to action. I always write final words or add a message at the last of my post. I ask my readers to leave their comments. Trust me 'call to action' really works. If you write well and according to the needs of your readers then definitely they will share your posts and appreciate your work. If your article provides useful information then your post will be linked to other websites without asking owners to do so or without writing guest posts. Also, don't think like that Google ranks only longer posts, it's just a myth. Google gives rank according to the information included in the post. If you search some common words then you can see how articles with short length have been enjoying top positions in SERP's. For the Rank, only Quality matter not quantity or length. I have tried my best to write the key elements of writing a good quality post. But I would love to have your suggestions and comments for this post. Also, if you are satisfied and liked this post then don't forget to share it on your social profiles and also you can link this post on your blogs. 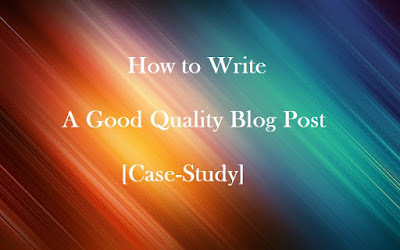 Message: I hope that you have enjoyed '[Case Study] How to Write a Quality Blog Post to Get High Quality Backlinks' article. However, if you want me to deliver more items, then please share my post. You can use Social Sharing Widget provided at the end of every post. After all, Sharing is Caring!